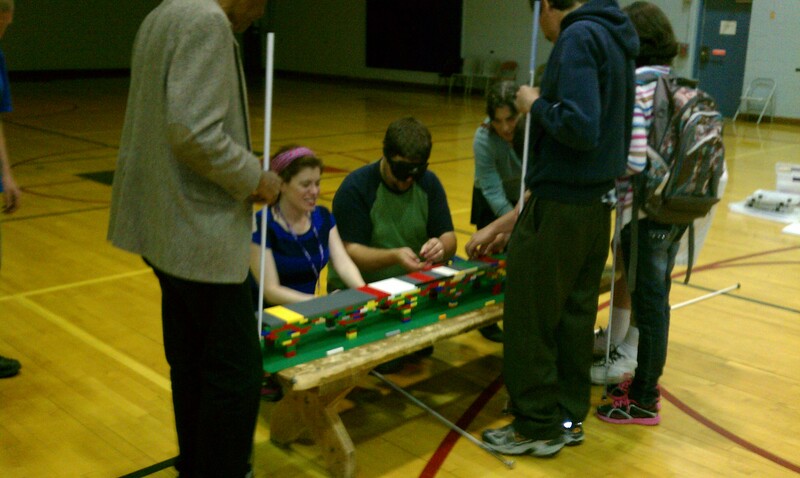 The Colorado Center of the Blind is “a renowned training center that has provided innovative teaching techniques and philosophy on the lives of blind people, taking them to new heights of independence”. 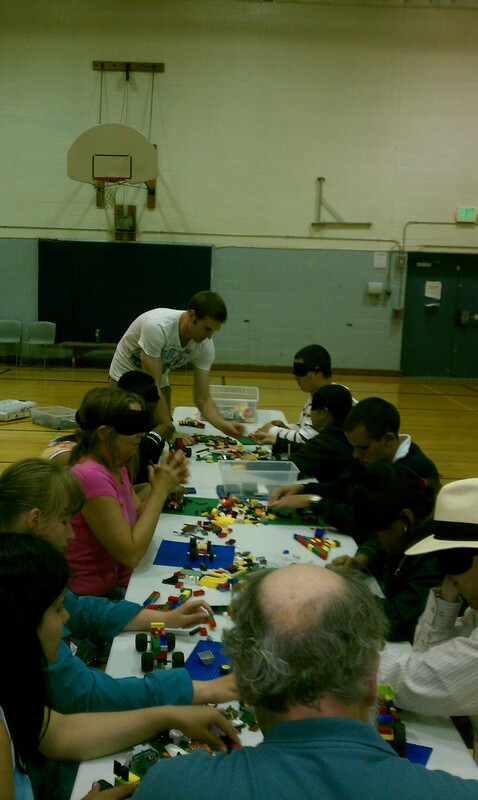 They reached out to us in early May to see if we would be interested in bringing STEM based programs to their summer program held yearly for blind children at their center. In our meeting to plan for our STEM workshop, we wanted to see and try out our program with their summer program leadership team. This was in order to help our instructors feel comfortable in adapting our teaching styles to be able to teach the blind. We provided a workshop for their summer program counselors on Tuesday June 4th. What a truly eye opening experience! 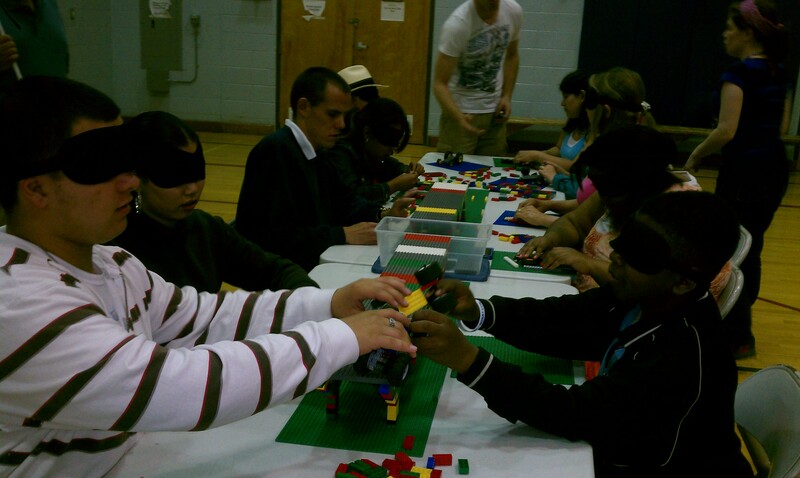 When teaching our program, we really were unprepared with just how high functioning our blind students were. Not only were they focused on our directions, but we were blown away at their spatial awareness. We told them where to find the LEGO bricks around them and after some brief directions, they were on their way! 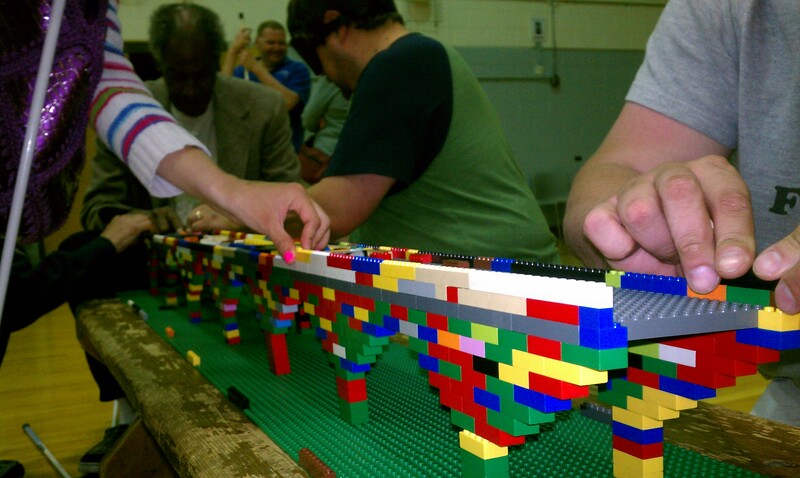 Our students did their build at a table with LEGO 2×4 bricks spread out in front of them. Jen Schubert, did a wonderful job introducing what the pieces we were going to use, describing the type of bricks we would use and the orientation of each brick, as they were expected to build two piers of our corbelled arch bridge. LEGOs are tactile, their studs are not only beneficial for building with, but working with our blind friends, we were able to clearly describe how each brick fit for each layer of our bridge. We also had 2 sample piers prepared as well, and our students used the example to see our project: counting the layers of each “staircase,” the cracks of each stack, and the cracks between bricks to make sure their piers were built correctly. Some builders were done within the first five minutes of the build! We added the deck plates and our early finishers got started by adding 1x bricks to the outside studs for railings. We had prepared 32×32 sheets with pieces to create a gravity car chassis if we had time. And did we ever! We had two gravity car chassis that were being shared by the group as they felt the holes of each beam to make sure they placed their axles correctly. They found their bushings and 4x plates after first orienting themselves with the pieces by touch. The gravity car was a little more difficult for some builders, but with persistence and guidance by Nick Spencer and Rob Angcay every single student not only created a gravity car chassis, but used decoration pieces also found on the table to create race cars, trucks, tractors, and one even had a propeller to fly! We transferred their bridge from the table to a bench about 3 feet away from where they built it. Our students then were able to finally see out long their bridge became by walking over and orienting themselves to the end of the bridge solely by following the directions of Rob Angcay’s voice. Then, they walked the length of the bridge one by one. “Whoa, we made it this long?” were some words of excitement from our students. They then made their way back to the table to begin clean up. Our students were able to take their gravity car apart and create build piles, where they returned their pieces to their specific bins as Jen and Nick walked around the table with specific piece bins, letting them know which pieces belonged to their bin. What a success! Our instructors felt rewarded, and most importantly we have started a wonderful relationship with an amazing program. We plan to return to offer a weekend workshop in July where we will teach another program with the kids of their summer program.